The All Progressives Congress (APC) Presidential Campaign Council yesterday gave reasons why Peoples Democratic Party (PDP) presidential candidate Atiku Abubakar, cannot be trusted by Nigerians. APC Presidential Campaign Council spokesperson Festus Keyamo said Atiku is a questionable character who has continued to leave huge questions over his suitability for the highest office of the land. In his view, Atikuâ€™s visit to the United States has destroyed his campaign and exposed him. â€œThe visit had all the trappings of a fugitive sneaking into America under a â€˜special diplomatic waiverâ€™. For the candidate of the major opposition party in Nigeria, it is an absolute disaster that the visit was not announced ahead of time in Nigeria, with his programmes and itinerary clearly spelt out, the decent and customary minimum standard of such visits. This culminated in his close aides issuing conflicting statements about the visit when he was already on his way there. In fact, one of them called Paul Ibe actually spoke to the Press that his principal was nowhere near America! Such was the secrecy of the planning and execution of that visit. â€œIt is shameful that a presidential candidate of a major opposition party in Africaâ€™s most populous country would visit America, and the international press was kept in the dark: There was NO SINGLE press conference with the array of international media and correspondents required for such â€˜high-profileâ€™ visit. Atiku knows he has no moral stamina to withstand the avalanche of hard questions bordering on his sordid past in America. 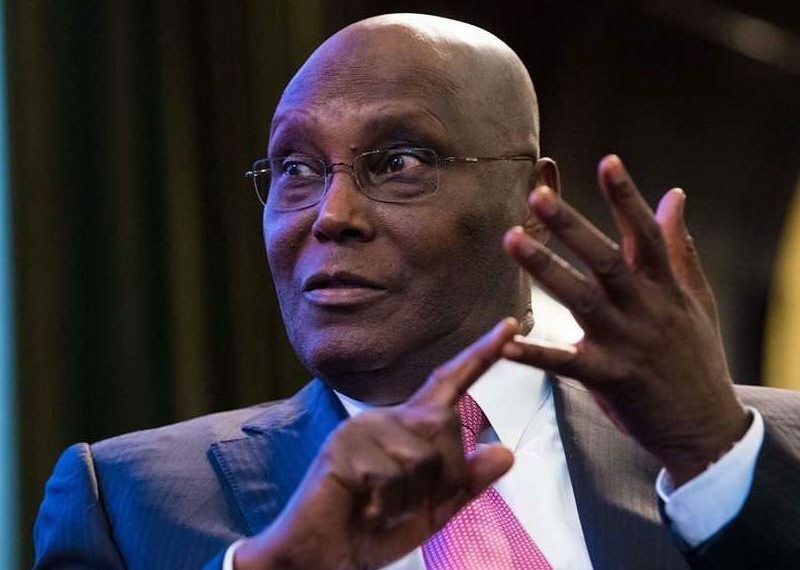 In fact, Alhaji Atiku Abubakar claims he visited the Voice of America (VOA) but only did two carefully-packaged interviews with the Hausa service and the English to Africa programme â€“ platforms that have always been available to him back home. â€œHow strange! In fact, both the Twitter handle (@VOANews) and official website of VOA did not mention any such visit of Alhaji Atiku Abubakar to their station. For news hounds, you would agree with us that such an â€˜important personalityâ€™ cannot walk into a news premises without reporters swooping on him. Whatever he went to do in the premises of the VOA must have been a carefully-arranged private visit for the photo-ops, which was intended to scam Nigerians. What more evidence do we need of a â€œsneak-in-sneak-outâ€ arrangement than this?. â€œFor a candidate who claims he wants to â€œget Nigeria working againâ€ (a meaningless phrase) to sneak into America without meeting major players in private businesses is a curiosity and an indication that we are dealing with a candidate with a dodgy and questionable character. He claims he went to the U.S Chamber of Commerce, which is supposed to be a business federation. â€œAgain, the Twitter handle (@USChamber) and the website of the organisation make no mention of the visit of such an â€˜important personalityâ€™ to them. Maybe their famous American lobbyist on a salary of N9million per month can help them â€˜do somethingâ€™ about this after this press statement. â€œIt is also an anomaly that the candidate of the major opposition party in Nigeria sneaked into America and did not meet large sections of political leaders of similar ideologies and persuasions towards which he claims to be inclined. For all his claim to be going to America to meet â€œU.S Government officialsâ€, he only succeeded in meeting a certain â€œCongressman Smithâ€, who is the equivalent of a member of the House of Representatives in Nigeria. He said that it was very obvious now that the American trip was a desperate trip for photo-ops. He added: â€œThroughout the trip, Atiku Abubakar looked cagey, frightened and on edge. We note the close support always provided by Senate President Bukola Saraki like a comforting guardian angel. â€œThe visit and arrangements smack of things local yahoo yahoo boys do to scam their victims. It is utterly disgusting and puerile that it has been brought into a serious political contest. â€œRather than being the highpoint of his campaign, the American visit is indeed the lowest watermark of Atiku Abubakarâ€™s campaign. It was a political and P.R disaster. The statements he released from there only to the Nigerian Press back home that he intends to alienate other countries and do business with the U.S is actually the antithesis to our policy of non-alignment. â€œFor the information of Alhaji Atiku Abubakar and his handlers, Nigerians know that Nigeria is already working again for everyone and not for a few. As confirmed by him in a town-hall meeting a few days before his disastrous trip to the U.S, he said he wants to â€œget Nigeria working againâ€ only for few of his friends who he claims he wants to make rich. â€œIf he cannot get them rich now from his private businesses, it is obvious that he is referring to the use of public funds to make his friends rich. Nigerians should judge for themselves whether this is the type of President they want. Atiku was just disturbing himself... He is not fit to be Nigeria president... Fela Durotoye could have been more better if it were to be that he is coming out under PDP... Who agree with this?